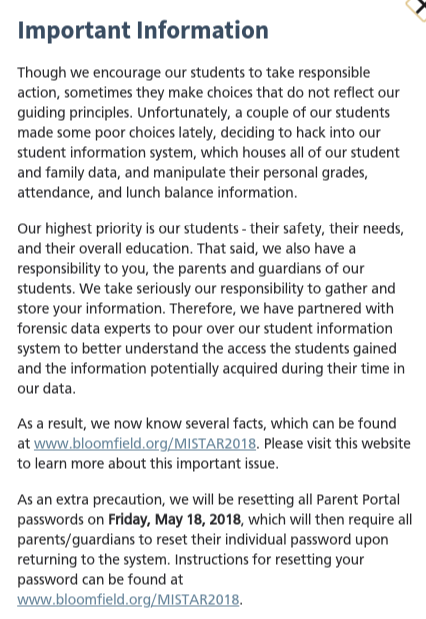 In what may be one of the more comprehensive disclosures of a school cybersecurity incident, the Bloomington Hills Schools today announced students hacked into the student information system “MISTAR” to make changes to grades, attendance, and lunch balances. Shared a recorded video message from Superintendent Robert Glass. 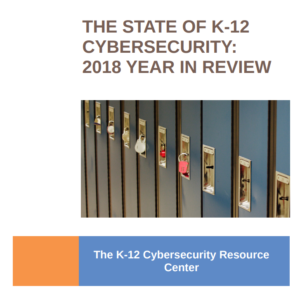 This incident is yet another in a recent string of events involving the hacking of school IT systems by students, including most recently in New Mexico, California, and Utah. While I understand why schools would want to discourage copy cat behavior and hold those responsible to account, I fear that existing policy frameworks are not well-suited to treating teens fairly in incidents like these. These are minors, we encourage their interest in coding and STEM education, we romanticize hacking culture, watch as high-tech companies offer hackers well-paying jobs, and we build systems that teens have repeatedly demonstrated are less than secure. My hats off to Bloomington Hills Schools for the comprehensiveness of their initial response to the cyber incident they’ve experienced. It is no longer a question of whether a district will need to respond to a cyber incident, but how. Their example should serve as a model for others.